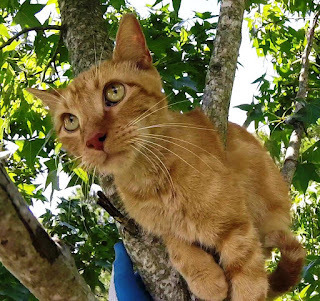 Rod and Melinda just recently moved all the way down to Biloxi, Mississippi from the western part of Washington state where there are numerous rescuers of cats stuck in trees from which to choose if they had needed it. But they never needed that. Just two months after they moved, however, they suddenly found themselves in need when their eight-month old orange tabby girl, Nala, climbed up high in a tree in their yard. Now they found their options very limited. 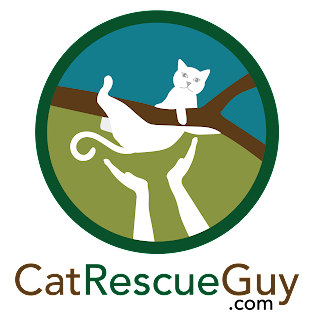 The only rescuer they could find in the whole state of Mississippi was Bob Reese up in the northern part of the state, but it was too far to expect him to go all the way down to the coast for a rescue. Nevertheless, they contacted him just in case, and he referred them to me, since I was much closer. They contacted me, and I agreed to go out there the next morning, Nala's fourth day in the tree. The next morning, I left as early as I could, and, when I arrived, I met Melinda who led me to Nala. Nala was in a bad spot. 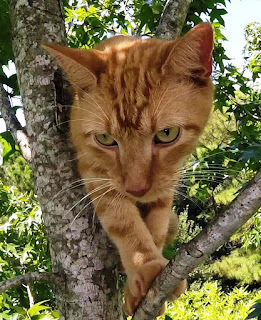 She was about 55 feet high on a nearly-vertical stem near the top of the tree, and she was perched uncomfortably on small limbs. 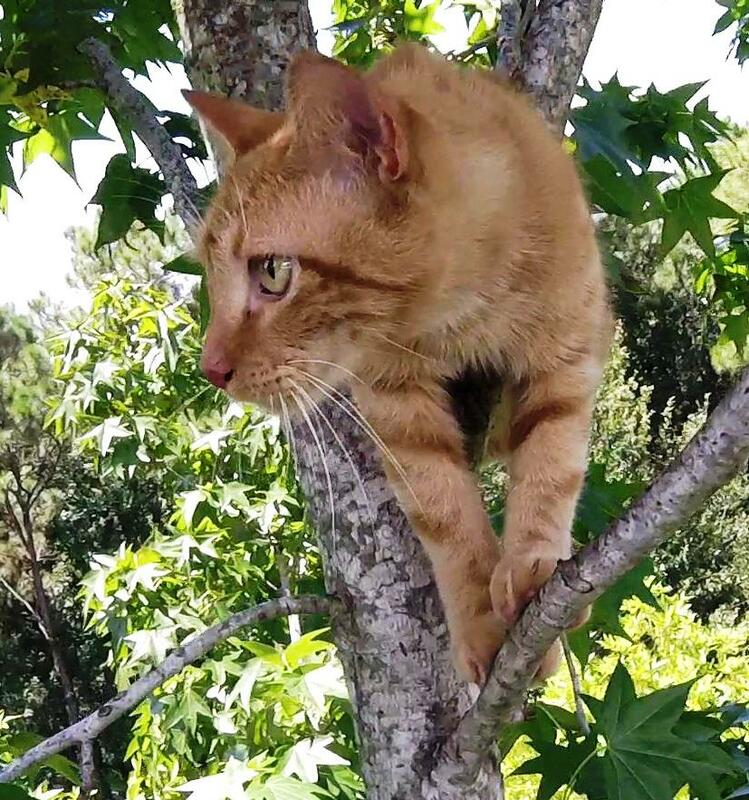 Normally, I like to set my rope in the tree above the cat, but that would not be possible this time because Nala was already near the top and there were no sizable limbs above her. The only place to install my rope that I could see was just five feet below her, and I was a bit hesitant to try to shoot my weighted bag over that crotch so close to Nala. It's not possible to aim the large sling-shot with that much precision at that distance, so I was concerned about hitting her. Fortunately, though it took me five times to shoot the bag where I wanted, I did eventually hit my target without hitting Nala. I installed my rope and began to climb up to her through some narrow spaces between branches while pulling out some dead branches and cutting a small branch to make room for my passage. 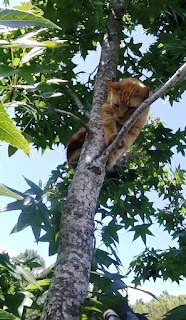 I climbed up as high as my rope allowed, but I was still below Nala. I used another rope to pull myself up closer to her and was now close enough to let her sniff my hand. She very calmly and sweetly sniffed and allowed me to touch her. I brushed my finger across her face and petted her head, and she was very comfortable with that. 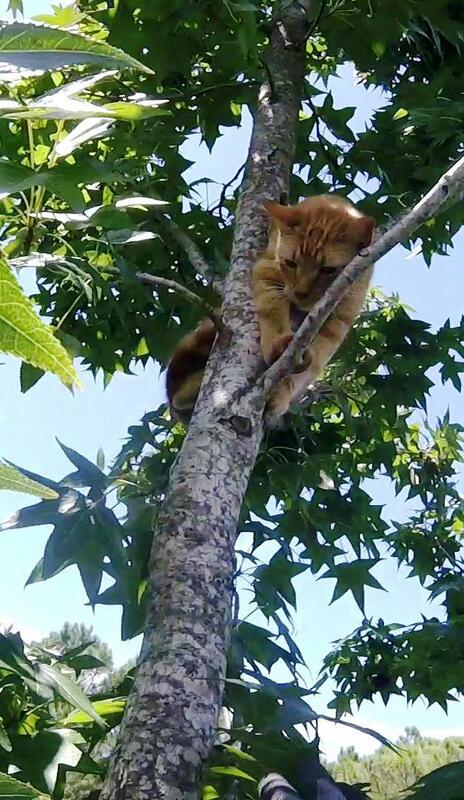 I was very relieved to see that she would be cooperative, but also a bit concerned about how I was going to get her out of her perch. I would need to lift her up out of the narrow crotch her body was in, so I needed to get yet a little higher. By pulling myself up to stand in the crotch where my rope was installed and securing myself with another rope, I was able to reach her well enough. I prepared my cat bag on one hand and pulled myself up to her. I petted her some more and then began to pull her out of the crotch toward me with one hand while lifting and pushing her rear end through the crotch with the other hand. Once her back legs were on the crotch, I grabbed her by the scruff, pulled her free and pulled the bag over her. That sweet girl never squirmed or uttered a single sound while I bagged her and brought her down. Once on the ground, I handed her over to Melinda who took her inside. She graciously allowed me to follow her inside to see the release. That's often my favorite part, so I always appreciate that opportunity. She set Nala on a bed and opened the bag for her. Nala knew right away that she was home and safe. Melinda picked her up and kissed her, but like most cats, Nala didn't like to be kissed and she pulled away. Besides, she had more important things to do right now. She was hungry and wanted to eat. Melinda set her down by her food and water bowls, and Nala began to eat. I thanked Nala for being so cooperative and said goodbye. So what if it was a hot day and a difficult climb and a two-hour drive. 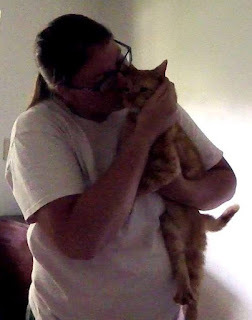 Once I see Nala safe and happy back home and Melinda relieved to have her baby back in her arms, it's so, so worth it.